The Tafo Municipal Assembly is battling with its Suame counterpart as to who controls the Tafo public cemetery to strengthen its revenue base. The development comes on the heels of the carving of five municipal assemblies out of the Kumasi Metropolitan Assembly (KMA) by the government in March last year. The move was to strengthen the decentralization policy under the local government system. Intelligence available to us has it that there is a lingering boundary dispute between the two municipal assemblies, as to which of them controls a larger portion f the entire Tafo graveyard. This development has compelled the Ashanti Regional Minister, Simon Osei Mensah, to intervene and address the demarcation of boundaries between the two municipal assemblies. Currently, revenue collection at the cemetery goes to the Tafo Municipal Assembly. Other newly-created municipalities are also reported to be facing similar problems, regarding revenue collection. The feud between the Tafo and Suame assemblies has been attributed to the flamboyant nature of funerals in the Ashanti Region, thus pushing up the cost of land in the said graveyard. 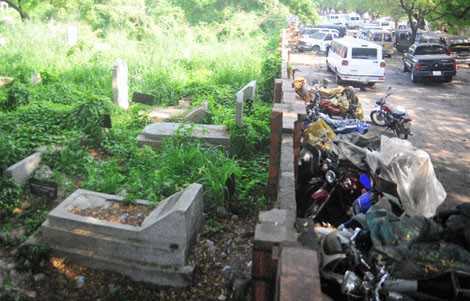 Investigations conducted by The Chronicle reveal that a piece of land close to the entrance of the cemetery is sold for GH¢3,000 by sexton officers, making the assemblies believe the cemetery is a base for Internally Generated Fund (IGF) for their development projects. Meanwhile, both the Municipal Chief Executive of Tafo Municipality, Mr. Fred Obeng, and Dr. Samuel Bobie, the MCE for Suame, say there is no such friction, because the Ashanti Regional Minister is working on the boundaries.